About 25 percent of seniors fall each year; over 27,000 die as a result. Whether it be from ailing seniors recovering from surgery trying to get out of bed, senior with dementia or Alzheimers who are prone to wandering, or simply elderly seniors getting out of bed for the day. Being alerted to your loved ones activities adds some peace of mind in your caregiver duties. And the new technology that you’ll see in a sensor mat will be a welcome addition for products geared at fall prevention. Our roundup will show you how you can make your home safer for you or a loved one. It works as described though a bit costly. The caregiver has three different options for setting the alarm. It works within a 500-foot radius. The sound won’t disturb others in the room or startle the patient. The mat is reversible and latex-free. 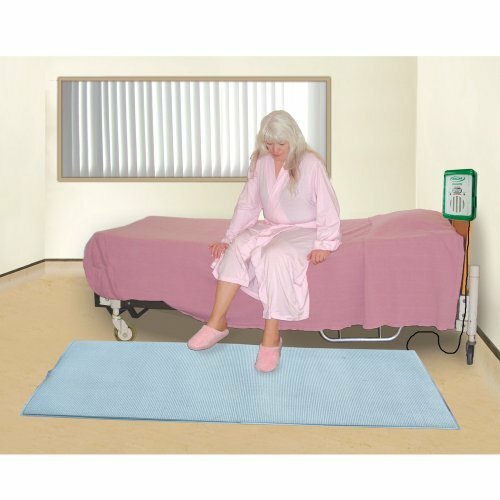 The Secure Floor Mat Sensor is an excellent solution that considers both the senior and the caregiver in its design and features. The premise like similar products is to alert someone when the patient needs help or has gotten out of bed. It doesn’t ring in the room but instead through a pager that is worn by a nurse. The mat is a decent size. It will hold up to regular use too. The system is self-contained and will work with other Secure products. The pager can monitor up to four devices. Our primary concern is that the alarm continues buzzing as long as someone—or a pet—is standing on the mat, even with the reset button. The issue of being triggered accidentally is one you likely encounter with any product. It is value-priced for use either indoors or outdoors. 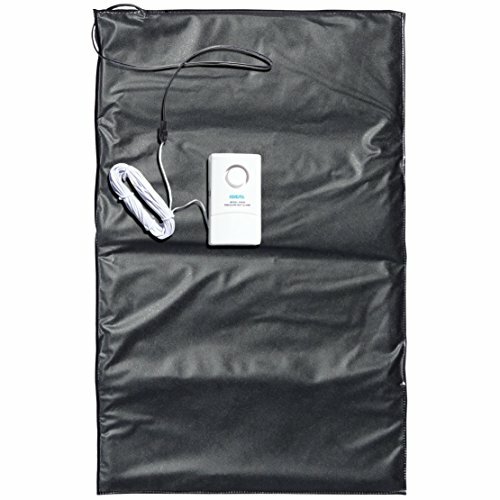 The Ideal Security SOLO Pressure Mat is a corded, battery-operated unit that can be used to let a caregiver know when their patient or loved one gets out of bed. It can also be used it as a security device outside the front door. There are three volume modes: a loud alarm; a chiming sound; or off for when you don’t need alerts. The loud alarms are either 90 or 105 dB. The former is about the same volume as a lawnmower and the latter, about that of a table saw. You will hear it. The mat is also useful for seniors with dementia or Alzheimers who are prone to wandering, when placed in front of a door they don’t need to be accessing. The mat isn’t waterproof but can withstand temperatures up to 122 degrees F. On the low end, 14 degrees F is the threshold. If you put it outside, you should cover it with another one that is either water-resistant or waterproof to avoid damaging it. It is a complete system that provides reliable service. Complete System includes: 1 Economy exit alarm and 1 floor mat. 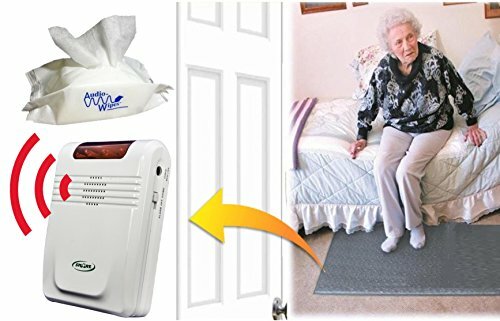 The Smart Caregiver Floor Mat Exit Alarm is a complete sensor system for seniors. It is a corded system with the monitor attached to the mat and has several additions that make it worth a look such as a volume control, power options, and low battery alert. You can use it in a hospital or care facility since it can connect to an existing call system. The mat works great as a sensor to indicate when a senior or loved one has gotten out of bed; it is also thick enough to provide some cushioning in case of any potential falls. The alarm sensor is sensitive, meaning that pets will trigger it too. That’s not unique to this product, but it’s certainly a factor to keep in mind if you decide to buy one with an alarm. The mat is a good size and is water-resistant. The product performs as advertised and adds a welcome safety element for seniors. You can use it with any plug-in light source. This product is great when used to remotely turn on a lamp or light when someone gets out of bed! The Smart Caregiver Light with Cordless Floor Mat isn’t an alarm per se. Instead, its purpose is to provide light for a senior getting out of bed. We really appreciate this function since many falls happen at night while trying to travel to the bathroom, in the darkness. It is a wireless smart device and includes an outlet that you can set up with your lamp so that it’ll turn on once the sensor mat detects weight on it. It is a good sized mat and comfortable when you walk on it. You can use it with any lamp in the room that is within its 150-foot range. We like the versatility that this feature adds to its use. It helps save on the cost of buying a unit that includes one that may not fit with your decor. Bear in mind that unobstructed space is the ideal conditions for which to use this unit. There is an option to purchase a Cordless Monitor in addition, to serve as an alert system when triggered. It is a wireless system with an excellent range. The Smart Caregiver Fall Monitor and Floor Mat is another complete system that includes everything you need to ensure your or your loved one’s safety. Again, it can be placed by a bedside or in front of a doorway to alert you when your loved one is out of bed or wandering around. It has several options that we appreciate such as the adjustable volume control and power sources. It is a wireless setup with a decent range for use in a care facility or at home. The package also includes disinfectant wipes. While we like having them, they aren’t necessary since any household cleaner can clean the items. You can pair the alarm with multiple mats which makes it an excellent choice for care facilities or if you choose to put one on both sides of your bed. Now that you know what’s available let’s discuss the technology and product features in more detail. This market has exploded in recent years with the advent of smart devices. No doubt, you’ve seen other items that use it such as thermostats, light bulbs, and outlets. We think it’s a significant step forward to improve fall prevention. 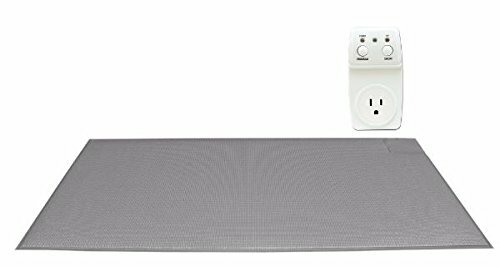 You’ll find both corded and wireless mats. The former are often less expensive. The setup is typical with the monitor and sensor attached. That means the alarm sounds in the patient’s room. The disadvantages of these systems are that it will likely disturb others in the same room and perhaps frighten the individual. The presence of a cord presents another fall risk. Wireless setups avoid some of these issues. You can place a monitor outside of the room or at a nurses station. Signal ranges vary, so we recommend checking out this spec when considering this purchase. Bear in mind that the figure refers to unobstructed space. Other devices may interfere with its usefulness. Another benefit of these types of products is the ability to pair more than one sensor to the main alarm. You’ll usually find that these items are compatible with other ones in the manufacturer’s line. That gives you the ability to set up your system to fit your needs and situation. We’d suggest looking at other offerings as part of your purchase decision if you want to make use of this option. Sensor mats are part of a system that includes another component whether it’s an alarm or another smart device. We strongly urge you to read the product description carefully to learn whether you need to buy any additional items. You can expect to pay around $100 or more for a complete system. Mats don’t vary a great deal even when it comes to color. Most products we saw were gray and without other choices. An adequate size is an essential feature no matter what type you buy. A non-slip surface is important as well. Remember that these items are not a replacement for a fall mat. They will not provide any added protection in case you slip. The alarm is where you’ll see a variety of features worth noting. Perhaps the one we like most is a reset button for the caregiver to press once she has responded to a call. We prefer products that have a switch that is accessible so that you can turn it off if it gets triggered accidentally. You’ll often find volume controls too which is a must-have for us. Wireless products provide a clear advantage over corded ones as we discussed above. It also allows for remote monitoring which is another benefit we appreciate. Many products offer dual power options which add to their convenience. Make sure to check the description to see what is included, noting the type of batteries that you’ll need to have on hand. The unit may have an adaptor or at least an option one that you can buy. That offers an advantage if 24/7 monitoring is essential without the worry of a battery going dead. We suggest using the one that the manufacturer recommends. Not all products are compatible across the board. As our roundup included, there are other connected units available too such as smart outlets. You’ll see other supported items in the manufacturer’s line too which adds to their versatility. We also liked the option of adding more than one to the alarm. The downside of using these features is that you’re limited to one company since the pairing is proprietary. The technology of sensor mats has taken off in recent years with smart devices. As it improves, so too will the availability and features of these products. It will continue to make the lives of seniors and their caregivers easier and safer.